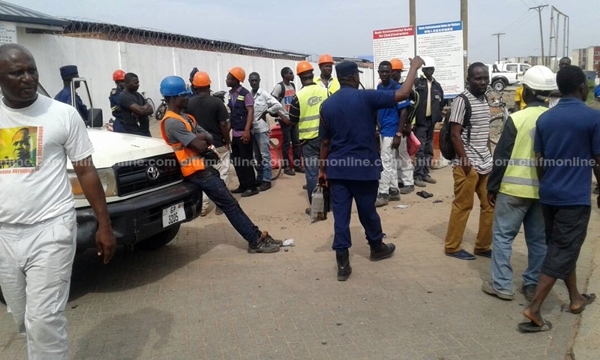 Workers of the China Harbour Engineering Company Limited on Thursday morning clashed with the police in Tema as they were protesting against the management of the company over poor conditions of service. The workers, numbering about 500, had to run into the community three flats as they were fired with tear gas and rubber bullets by the Tema Police. According to the workers, three of them have sustained injuries from the rubber bullets , and have been sent to the hospital for treatment. The workers complained that they are not treated fairly by their employers hence the need to lay down their tools. Early in May, the workers staged a major demonstration where they called on management to abrogate a recruitment contract it had with L’aine Services. According to them, the recruitment agency, L’aine Services, wasn’t paying them the right amount due them hence the call for the abrogation of the contract. Pursuant to that, a Deputy Transport Minister, Titus Glover, tasked the company, together with the General Secretary of the Maritime and Dock Workers Union, Owusu Koranteng, to find a lasting solution to the issues raised by the workers, which later resulted in the abrogation of the contract between the management of the company and L’aine Services. However, barely a month after the abrogation of the contract with L’aine Services, the workers are still unhappy with their management since they have failed to implement a new salary pay structure as directed by the deputy transport minister resulting in the confusion with the police. According to them, apart from the bad salaries they earn, they are not being treated well by their Chinese supervisors. The China Harbour Engineering Company Limited is a sub construction company under MPS, undertaking the Tema main Harbour expansion project. Calm has however been restored at the facility, as the workers have been asked to go home temporarily.